There are very few places left in the world, where you can see the process of how paper is made, in the very same place it used to be made during its glory days. What used to be a fully functional paper mill in the medieval times, has now been restored and transformed into the Basel Paper Mill Museum. Taking you back to a time when there were a dime a dozen paper mills, the Museum shows you how paper was processed, typesetting and book binding was done. If you’d like to try your hand at this craft, you could participate in the process and take home your very own processed paper. How popular is Basel Paper Mill Museum? People normally club together The Cathedral Munster and Kunst Museum while planning their visit to Basel Paper Mill Museum. Fascinating look at the history and practice of papermaking, typography and printmaking. Great for kids and adults alike. Still produces bespoke printed paper, too. This was a real gem of a place, with loads to see and do. The building itself is quite quirky with parts of it dating back to medieval times - lots of low doorways, beams and creaky floorboards! The layout is quite straight forward with a floor dedicated to paper making, then one to book binding, then printing and so on. There's a lot of interactive elements and it's a good place to bring children, as the paper making is ideal for them. Everything is in English, Italian, French and German, so we got by perfectly. The staff were all really friendly, helpful people, and we very much enjoyed our visit. I think that they could make more of the gift shop however, considering a lot of people like novelty stationery, there wasn't much there! So much fun. Making paper, marbling paper, typing on paper, folding paper, writing with quills on paper. Loved it! A fabulous museum to visit in Basel. Fun and interactive. 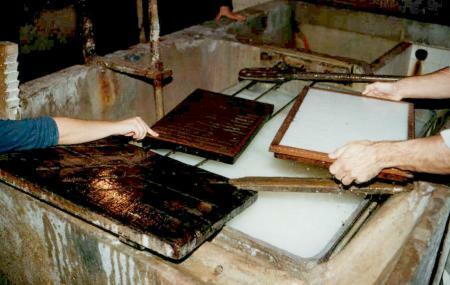 You can experience paper making, printing, calligraphy writing and the marbling technique is a must. The museum looks small from the outside but it’s really quirky with lots of different rooms. The exhibits & descriptions are very informative & layout has a good flow. Staff members are extremely helpful and friendly, definitely going to visit this museum again.